The state of Vermont, with a population of just 626,000, will soon mandate food and farm policy for the entire country—319 million people. In an affront to federalism, Vermont’s 180-member legislature has usurped the authority of 7,382 state legislators nationwide, while pre-empting the power of the U.S. Congress to regulate interstate commerce. All food and beverage companies that sell products coast-to-coast will be obliged to comply with the Vermont law, which will result in a de facto national, mandatory GMO labeling regime. One tiny state in America’s northeast corner, where forests cover 75 percent of its total land area, will govern farm and food growing policy for the whole United States. Genetically modified organisms (GMOs) are among the most analyzed subjects in science. With over 2,000 global studies affirming safety, the science over GM foods is unquestionably settled. The world’s most prestigious science, health, and academic institutions have confirmed and re-confirmed over again that GMO science does not pose a risk to our health, and GM foods are as safe and/or safer than conventional or organic foods. In an overview of the last 10 years of genetically engineered crop safety research, scientists could not find a single instance where GMO food posed any harm to humans or animals. GMOs are safe and healthy, period. Yet, activists—like those in Vermont—still sound the anti-GMO alarm, and their failure to consider the science when advocating policy betrays their true agenda. The activists' ultimate goal is not "freedom of choice" or the "right to know" for consumers, as they claim, but to drive GMO foods out of the market. Or, Joseph Mercola, an alternative-medicine advocate, who has said, “GM foods must be banned entirely, but labeling is the most efficient way to achieve this.” Veteran activist and organizer Ronnie Cummins has called labeling laws “the crucial blow to GMOs.” And, Geert Ritsema of Friends of the Earth Europe has affirmed, "If these products all have to be labeled, who is going to put it on the market?" GMOs do make up a major part of the American diet: 80 percent of all food on supermarket shelves is GMO. So the issue of labeling needs to be addressed in a manner that defers to sound science and consumer safety. There is bi-partisan legislation passed by the House of Representatives that would head off Vermont’s mandate and create federal standards for food labeling. 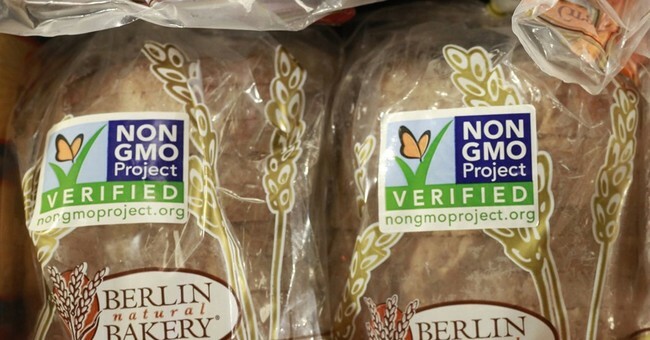 Under the bill, companies would have to file a "premarket notification" before selling GMO foods, and the secretary of health and human services would ensure that all GMO foods are at least as safe as their non-GMO counterparts. This legislation, establishing a national voluntary labeling system, also passed out of the Senate Agriculture Committee. However, the bill—proposed by Senate Agriculture Committee chairman Pat Roberts (R­Kan)—was blocked on the Senate floor because a handful of Democrats wanted additional disclosure requirements for GM ingredients. Senator Roberts could not reach an agreement on the disclosure provisions before the cloture vote, and his bill failed to get the 60 votes necessary to advance. Ironically, given Senator Lee’s objection, if the Senate doesn’t act, a mandate in the form of Vermont’s anti-GMO law is exactly what will be forced on the entire nation. Vermont’s food labeling law, which goes into effect July 1,2016, requires food companies to caution consumers as to which products on grocers' shelves have genetically modified ingredients. With this state fiat, Vermont will be forcing farmers, processors, and retailers from across the country to disrupt the nation’s entire food chain. Vermont’s mandatory label law is potentially a huge victory for anti-GMO activists and Crony Corporatists. The activists are on an ideological crusade, but the organic-food industry, which has put millions of dollars into anti-GMO lobbying efforts, will reap enormous financial rewards once their competitors are jettisoned from the market. Vermont’s GMO labeling mandate will help push GM food—remember the 80 percent—from our food supply. The stakes are that high. The facts about GMOs and the science of biotechnology are indisputable. GM foods are safe and healthy so let’s hope Senators Roberts and Lee and their colleagues reach an agreement and put an end to this unnecessary GMO food fight. If not, the activists and organic food lobbyists will have their way, and the American people will have fewer choices on the shelves, face higher food prices, and be under the intrusive eye of the activist food police.